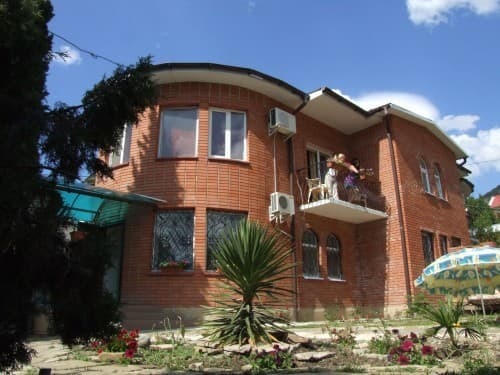 We offer you an unforgettable vacation in the Crimea, in a private hotel, "Merry Scorpena", which is located in the village New World. On vacation in Crimea, in the New World, you will find a comfortable hotel suites. The hotel has two wings, equipped with their own courtyards. There is a convenient platform for holidays on the fenced area of the hotel under relict junipers with gazebo, barbecue, dastarkhan. The playground for small children with swings and a sandbox is organized. 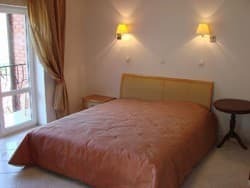 Description of the room: The room with the total area of 18 square meters is situated on the ground floor in the left wing of the hotel from the southern side. From the windows a vie of the mountain Sokol is opened. An individuale entrance. There is italian thin slab and carpets on the floor. a modern two-place bed with orthopaedic mattress. A coffee table and cosy soft armchairs. A wardrobe. There is a bathroom unit, equipped with italien bathroom equipment, an electric drier, a shower cubicle, a hairdryer, a cabinet for the hygienic items. 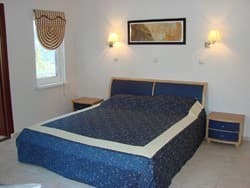 Description of the room: A spacious room of the hotel with the total area of 27 square meters is situated on the second floor in the left wing of the hotel from the southern side. From the windows of the room, and also from the balcony, where a table and some chairs are situated, the view of the Nosovetskaya bay and of the mountain Sokol is opened.There is a modern italian thin slab and carpets on the floor. A modern two-place bed with orthopaedic mattress. A coffee table and cosy soft armchairs. A peg for clothes. There is a bathroom unit, equipped with italien bathroom equipment, an electric drier, a shower cubicle, a hairdryer, a cabinet for the hygienic items. Description of the room: Spacious room with total area of 32 square meters is situated on the ground floor in the right wing of the hotel. From the windows the view of the Nosovetskaya bay and mountain Sokol is opened. There is a modern italian thin slab and carpets on the floor. There are two bathroom units, equipped with italien bathroom equipment, an electric drier, a shower cubicle, a hairdryer, a cabinet for the hygienic items. 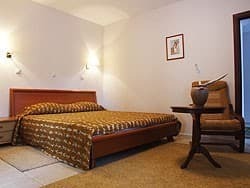 Description of the room: The biggest room of the hotel with the total area of 42,7 square meters is situated on the second floor in the right wing of the hotel from the southern side. From the windows of the room, and also from the balcony, where a table and some chairs are situated, the view of the Nosovetskaya bay, of the sea and of the mountain Sokol is opened.There is a modern italian thin slab and carpets on the floor. There are two bathroom units, equipped with italien bathroom equipment, an electric drier, a shower cubicle, a hairdryer, a cabinet for the hygienic items.